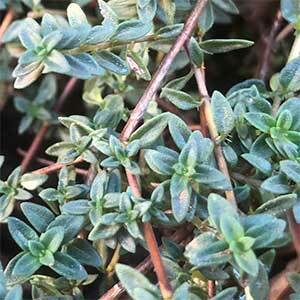 Low growing and with a distinct taste, Thymus herba barona is commonly called Caraway thyme. The foliage does smell like caraway seed when crushed, and it can be used as a caraway substitute in some recipes. Use the leaves either fresh or dried in breads, soups and stews. The plant itself is evergreen and reasonably low growing. In can be used in the kitchen garden or as a ground cover plant. It will reach around 15cm (6 inches) in height, so it is only suited to very light foot traffic areas. Full sun and a well drained humus rich soil will provide excellent conditions. Prune back after flowering to promote a bushy habit and good new growth. The best time to prune is in mid summer or just after flowering. To maintain a low growing ground cover trim the whole plant back to around 5cm in height.